We decked our halls last weekend. The boys helped put up the Christmas tree and they really loved getting to participate! We also read the book Deck the Halls illustrated by Veronica Vasylenko. This book is the lyrics to the traditional carol. The illustrator employs cute mice to deck out her book. The mice decorate a Christmas tree, hang the stockings, and make the cookies. The book ends with a Christmas party with family. Another great board book in the same jingling Christmas carol theme, is Jingle Bells also illustrated by Veronica Vasylenko. Both of these books are padded board books with glitter varnish. These would make a cute gift as a set for a toddler this Christmas. If you are just going to buy one, I would stick with the Deck the Halls book. The illustrations are more engaging in it. The Jingle Bells book seems to be the same picture on each page as the mice ride in a sleigh. There are slight variations, but I'm not sure preschoolers would notice the mice bouncing or the music notes around them signaling singing. Deck the Halls does a better job of showing a variety of Christmas activities that you could talk about with your child. Our 12 Days of Christmas Craft to accompany these two books, was to make a wreath for our "halls". I cut out a piece of green foam and then I gave Logan red and green buttons to glue to the foam. My wreath was about the size of a butter lid. We may hang this on the Christmas tree since it's a pretty small wreath. (By the way, Logan still calls this a donut. Maybe we should read more books about wreaths). 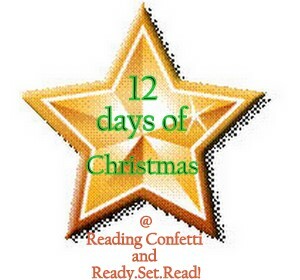 Dont' forget to check out the other 12 Days of Christmas books and crafts here at Ready. Set. Read! and Reading Confetti. Also, you can check out all of our books crafts in one easy spot on my 12 Days of Christmas Pinterest Board. Disclaimer: I was sent a free copy of these two books from the publisher in exchange for my honest review. Donut! Cute! :) We also have more experience with donuts than with wreaths around here. Love how cute it turned out! What a wonderful wreath! These books look cute!